The Galliformes are sister to the Anseriformes. Together, they are sister to Neoaves. The arrangement of Galliform families follows the genetic analyses of Crowe et al. (2006a), Cox et al. (2007), Hackett et al. (2008), and Meiklejohn et al. (2014). It is also consistent with Kaiser et al. (2007) and Kriegs et al. (2007), who analyze retropositions. Of the two, Kriegs et al. is more complete, and exhibits the same basic structure as the tree here. Since it is a different method of reading the genetic data, it represents significant additional support for the current arrangement of Galliform families. Nonetheless, there is still some question about whether the Numidade branch off before or after the Odontophoridae (e.g., Shen et al., 2010). 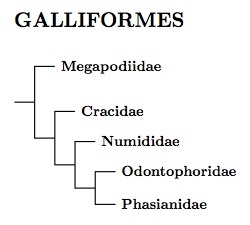 The Galliform tree takes the form of a cascade, with one group breaking off at a time until you get to the Phasianidae. It starts with the megapodes, then the Cracidae (guans, chachalacas, and curassows), guineafowl, and finally new world quail, all before we get to the Phasianidae. A number of genera have been rearranged or split compared with previous treatments. The genera decorated with question marks are uncertainly placed and could easily end up in a different subfamily. The arrangement of the megapodes is based on the complete multi-gene analysis by Harris et al. (2014b), which is similiar to the sparser 2-gene analysis of Birks and Edwards (2002). There has been a debate concerning whether the chachalacas and Horned Guan are more closely related to the guans or currasows. Pereira et al. (2002, 2009) found that the Horned Guan is closer to the currasows, and that the chachalacas are sister to the Horned Guan-Currasow clade. This topology has generally been supported by other studies, e.g., Kimball et al. (2011), although Frank-Hoeflich et al. (2006) found the opposite branching order using combined molecular, osteological, morphological, and behaviorial data (but see the response by Pereira et al., 2009). Pereira et al. (2002) estimated divergence times for various genus-level nodes. They found several divisions dating back to the Oligocene. I've used subfamilies and tribes to highlight these divisions. Except for the Horned Guan, they correspond to the traditional division into chachalacas, curassows, and guans. The genus Pipile has been submerged into Aburria (Grau et al., 2005). The arrangement of Aburria is based on Grau et al. (2005) and Robinson (2011). No comprehensive study of the guans is available. The order follows SACC. The chachalaca ordering is based on the analyses of Frank-Hoeflich et al. (2006). Interestingly, they found the Ortalis canicollis race pantanalensis on a separate branch from O. canicollis, whether this is an artifact or real is unclear. The order within the currasows is based on Pereira and Baker (2004), which also requires merging Mitu into Pauxi. Based on Gastañaga et al. (2011), Sira Curassow, Pauxi koepckeae, from the Sira Mountains in Peru, has been split from Horned Curassow, Pauxi unicornis. The SACC has split East Brazilian Chachalaca, Ortalis araucuan, and Scaled Chachalaca, Ortalis squamata, from Speckled Chachalaca, Ortalis guttata. Various issues have arisen concerning the Chachalaca tribe. I now use Donegan's Ortalidaini (Donegan, 2012) as all more natural forms are preoccupied by names based on the fly genus Ortalis Fallén 1810, a junior homonym of the chachalaca genus Ortalis Merrem 1786. The genus Ortalis Fannén 1810 has been used to establish the family-group names Ortalides Fallén, 1810, Ortalidae Swainson 1840, Ortalididae sensu Harris 1841, and Ortalisini Acloque, 1897, all of which are based on Ortalis Fallén 1810. See Donegan (2015). The last case rules out use of David's (2014) correction of Donegan's spelling Ortalidaini. There is also a discrepancy between the French and English versions of the ICXN that calls into question whether Ortalidaini is properly formed. Still, it is the best current option pending the outcome of ICZN case 3669 (Donegan, 2015). The order of genera follows Crowe et al. (2006a, b). This coincides with the cytochrome-b tree in Crowe et al. (2006a). Kimball et al. (2011) give a slighty different arrangement that swaps Numida and Guttera. Surprisingly, two Old World species thought to be unrelated members of Phasianidae have turned out to be sister taxa and basal members of the Odontophoridae. They are the Stone Partridge (Ptilopachus petrosus) and Nahan's Francolin, which I've moved to Acentrortyx (Chapin, 1926) as Nahan's Partridge, Acentrortyx nahani. See Crowe et al. (2006a) and Cohen et al. (2012). Although Cohen et al. recommend including Nahan'a Partridge in Ptilopachus, it has long been considered to belong to a separate genus and lives in an entirely different habitat. Moreover, they estimate a divergence time of 9.6 mya between the two taxa. The chronogram in Hosner et al. (2015a) makes clear that all other such divergences in Odontophoridae are treated in separate genera. Taking all this into account, I put the two African partridges in separate genera. The division between the two African partridges and the New World Quail is quite ancient. Cohen et al. (2012) estimated it between 33.9 and 55.8 mya (mostly likely in the Eocene), while Hosner et al. (2015a) put it between 27 and 38 mya (mid Oligocene to late-Eocene). Accordingly, I treat them as separate subfamilies. Bowie et al. (2013) created the name Ptilopachinae for this. The New World Quail are arranged based on Hosner et al. (2015a). Different methods of estimation gave slightly different results for Odontophorus. The biggest change involved the Spotted Wood-Quail, Odontophorus guttatus. Their concatenated tree put it sister to Stripe-faced Wood-Quail, Odontophorus balliviani. Their coalescent tree (Fig. 3b) is followed here. The divisions within the Phasianidae remain a problem. The papers by Bao et al. (2010), Bonilla et al. (2010), Crowe et al. (2006a, b), Kan et al. (2010), Kimball and Braun (2008), Kimball et al. (2011), Kriegs et al. (2007), Liu et al. (2012) Meng et al. (2008), and Shen et al. (2010) give different answers about how the various components of Phasianidae are related. This is especially true if you consider the individual gene trees contained in Shen et al. 's supplementary material. And what is one to make of Liu et al. (2012)? There does seem to be a broad, but not complete consensus that the Asiatic partridges (Rollulinae) are basal (see Liu et al. (2012) for a contrary view), and that some group containing Gallus is sister to a group containing the Phasianinae, but the placement of various pheasants (Pavonini, and Polyplectronini) and even the placement of the Tetraogallini is problematic (ditto its internal organization). Sometimes these tribes group near the Gallini in various configurations, sometimes they are not in a clade with Gallini and Phasianinae. Right now, the consensus seems to be running in favor of grouping these four tribes together (Pavonini, Polyplectronini, Gallini, and Tetraogallini) as Pavoninae but leave the branching order unresolved for the present. They are listed in order of size. How to piece together the Phasianinae subfamily had been a little tricky, but a consistent picture has now emerged. The current order is based on Kimball et al. (2011), which includes most of the species in the subfamily. Other than including more taxa, it is quite similar to the results of Kimball and Braun (2008). Phasianinae is their “erectile clade”. I have divided it into tribes to better show the relationships of the various groups. As you can see by their membership, these tribes generally correspond to what we think of as natural groupings. Bao et al. (2010) is generally consistent with the present arrangement of the Phasianinae. Crowe et al. (2006a) suggested that the turkeys and Perdix partridges might be sister genera, but that has gotten little support from recent analyses. Not surprisingly, part of the reconstruction of the Phasianidae involved moving some of the species to new genera. Crowe et al. (2006a) found two species that were quite wrongly placed: the Stone Partridge (Ptilopachus petrosus) and Nahan's Francolin (now Nahan's Partridge, Ptilopachus nahani), both of which ended up in the new world quail (Odontophoridae). When Crowe et al. (1992, with a different set of co-authors) had reorganized the francolins, they noted that Nahan's Francolin didn't appear to be a francolin. That reorganization is mostly supported by the new paper, but one other francolin proved problematic. The Crested Francolin, which they had already reassigned to the genus Peliperdix, is now Dendroperdix sephaena, although it remains in the junglefowl/francolin subfamily, Gallini. Eo et al. (2009) draws attention to several genera that are currently regarded as part of Phasianidae (Haematortyx, Melanoperdix, Rhizothera, Galloperdix). While it suggests closer scrutiny of these genera is in order, I don't buy the arrangement of them in the paper. I think it's an artifact of the supertree method. In fact, Sun et al. (2014) found that Haematortyx and Galloperdix belong near Polyplectron, a very different location than in Eo et al. Crowe et al. (2006a), does find that the Ptilopachus-Odontophoridae clade is sister to the Phasianidae, which is why I've moved Ptilopachus into Odontophoridae. They did not find Phasianidae nested within the Ptilopachus-Odontophoridae clade. I'm leaving the other genera highlighted by Eo et al. in Phasianidae for now, but we should keep in mind that some or all may too belong in Odontophoridae. Bonaparte's name Rollulinae has priority over Arborophilinae, Crowe et al. (2006a). Note that the Rubeho Forest Partridge, Xenoperdix obscuratus has been split from Udzungwa Forest Partridge, Xenoperdix udzungwensis (Bowie and Fjeldså, 2005). See Wang et al. (2013) for the treatment of Caloperdix as sister to Rollulus. The Chestnut-necklaced Partridge and Green-legged Partridge have been moved out of Arborophila and Rollulinae to become genus Tropicoperdix in Pavoninae. It is uncertain exactly where they belong in Pavoninae. One possibility is that they are basal in Pavonini. For now, they are left incertae sedis in Pavoninae (Chen et al., 2015). The arrangement of Polyplectron is based on Davison et al. (2012), Kimball et al. (2011, 2014) and Sun et al. (2014). Sun et al. (2014 also found that Galloperdix belongs here. The Taiwan Bamboo-Partridge, Bambusicola sonorivox, has been split from the Chinese Bamboo-Partridge, Bambusicola thoracicus. See Hung et al. (2014). The Orange River Francolin, Scleroptila gutturalis, has been split into Archer's Francolin (including subspecies archeri and lorti) and Orange River Francolin, Scleroptila levalliantoides. See Mandiwana-Neudani et al. (2014) and Sinclair and Ryan (2003). There are some other still-unpublished possible splits in Mandiwana-Neudani (2013). The Brown Quail is not closely related to the other Coturnix species (Seabrook-Davison et al., 2009; Kimball et al., 2011). Its closest relatives are Excalfactoria. However, it seems to be a fairly distant relative and I have placed it in Synoicus (Gould, 1843). Wang et al. (2013) found that Ammoperdix is a basal member of the Coturnix clade. The arrangement within Pternistis is based on Mandiwana-Neudani et al. (2014). Töpfer et al. (2014) recommend treating the Black-fronted Francolin, Pternistis castaneicollis atrifrons, as a separate species. However, the genetic differences are modest and I think more evidence is required. The Vietnamese Pheasant, Lophura hatinhensis, is considered part of Edwards's Pheasant, Lophura edwardsi. It appears to be either a subspecies or color morph. In any event, it is not genetically distinct (Hennache et al., 2003). Also, the arrangement within Lophura is based on Randi et al., 2001. The Turkeys are now consiered embedded in Tetraonini. Interestingly enough, using a combined mitochondrial and nuclear dataset, Kimball and Braun (2014) found that the Koklass Pheasant, Pucrasia macrolopha, is basal in this group. Note that an analysis of the complete mitochondrial genome puts it basal in the Phasianini (Meiklejohn et al., 2014).